to read what she and everyone else have not been doing this week. But first, hang out to see what we've NOT done at our house this week! I did NOT stay up very late on Tuesday, suddenly realize that it was 1:00am, and then futz around with this blog for another half an hour before shutting down my computer. I would NEVER do such a thing, with 3 kids to get up and ready for school before heading out for a client appointment Wednesday morning. Nope, Not Me! I did NOT get up Friday morning and realize that I had not put the load of jeans into the dryer the night before. As such, I did not make 2 of my children wait until the absolute last minute to put pants on before leaving for the bus stop. I certainly did not make J wear DAMP pants to school! What mother in her right mind would do such a thing!? And, since we have established that I am not the type of mother to do such things as send a child to school in pants that are not QUITE dry, I also certainly would NOT allow the kids to take crackers, pretzels and some Dunk'Ems snacks into their rooms, where they have built forts, in an attempt to get a little peace and quiet. That would invite grossness and bugs and who knows what, and I definitively would NOT do that! What fun have you NOT been up to this week!? Feel free to add it to my comments, or post it to your own blog and link to it using the MckLinky below leave your link in the comments and on MckMama's MckLinky - my copy is exploding! Then jump over and see what MckMama and other folks have NOT been doing! haha! Blog surfing can certainly keep you up late, huh! Feel free to stop by my neck of the blogging woods and see what I've "not been" up to. too bad I wore the damp jeans this week! :) and I never stay up late blogging either. it is so much fun (and quiet) to be blogging at night. Well, I don't think I have ever done it to my kids but I have done it to my husband and I have been forced to do it myself. Damp jeans are the worst. Your life seems just about as crazy as ours does. Hey! 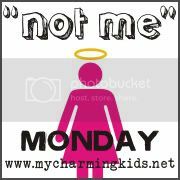 I loved your Not Me Monday! I have 4 boys so I can relate to NOT letting them take food into their rooms and build forts just for a few minute of peace! Ha Ha. I wanted to share with fellow MckMama readers a new blog that I have created. I'm going to be doing some great giveaways in the near future, so if you go to my blog and follow it, you can be part of the fun! Thanks so much! !